This is it! We are now a family of 3. A dream we had longed for and prayed about. It was not what I imagined it to be at the start, but thank you for weathering that season with me. I knew it drew out the best and the worst in me. Yet I thank you for still choosing to be with the messy me. Thank you for being strong when I was weak physically, mentally, emotionally and spiritually. I could not forget how you treated me so gently after I gave birth when my wound was leaking horribly. How persistent you were in treating it, changing my gauze day and night for almost 10 weeks and kept strong while I was in tears. It probably changed how you saw me, with how awful that leak and the holes in my wound looked, but you weathered that season with me. How you comforted me when I had a meltdown (due to Greyson’s confinement, breastfeeding issues… but the trigger was that all my clean clothes were used up plus I had no more sanitary pads :p) on my 7th day at the hospital . It was so silly but you did not laugh at me and you did your best to go as fast as you could to the convenience store. Thank you for being humble asking for help from friends to help us in this journey, it made things much easier to carry. Thank you for having a bright disposition despite spending your birthday and first Father’s Day at the hospital as Greyson was confined due to fever. He was admitted again just 2 days of us going home after a 7 day stay at the hospital. It was so disheartening and devastating for me that Greyson had a sudden onset of fever that he may have a delayed infection. It could be threatening since he was a newborn. Plus it really entered my mind that we used to really celebrate your past birthdays. I felt so bad that it should have been nice to celebrate your first birthday and first Father’s day as a family with our loved ones and with good food. But you didn’t mind at all. You shrugged it off and bought Max’s chicken and pancit sa suking hospital restaurant with all smiles and a heart that trusted that everything was okay with Greyson. It turned out that everything was okay with Grey, praise God. Thank you for teaching me how to parent Greyson as we both navigate this new chapter. For studying him and sharing with me your new discoveries (whether it be how you rocked him to sleep, how to give him tummy time, sit ups etc.). For taking the night shift, standing up quickly when Greyson is finally awake and carrying him outside so he can get his daily dose of sunshine. Just thank you for being a good father. I didn’t have one growing up and I did not know how it looks like. I do know that God is real and I have experienced His goodness and faithfulness in many ways – how He loves us without condition, accepts us over and over when we fail, how He disciplines us, comforts us, secures us, been our rock and our shelter, how He answers our prayers according to His plan. But by becoming a good father to Greyson, God our father is more real to touch and to experience for me. I am coming to know God all the more not just because what this new chapter is teaching us, but also how I see you with Greyson and with me. Thank you for pursuing me relentlessly to be your partner in everything – even things I don’t know about like business. You would always find ways to partner with me even if it meant us discussing a lot which leads to an argument at times. But at the end of everything you would still want me to be your partner. I would just like us to do our own thing sometimes. But you would not let it go and find things we could do together so we would always be together. Not that I don’t want us to be together, I enjoy your company so much it’s just that I’m afraid that I may not be able to do things on my own without you. Thank you for weathering my insecurities and doubts. Thank you for continuously weathering those with me. Thank you for finding ways to provide for us and being generous to people. By God’s grace He has blessed the work of your hands and may He continue to bless the work of your hands. Thank you for modeling generosity to me. You got that from your mom and dad. I know it is hard to let hard earned money go but you trust that God is your provider and He is your shepherd, you shall not want. You have taught me that we cannot out give the giver. I pray that Greyson will get that from you among other (admirable) things I see in you. Lastly, thank you for staying true to your word (so far:)) Many times I would like to quit but you would always fight for me. Thank you for keeping your promises – you said that parenting will be a challenge but it also would be the happiest. So far it is! It may be frustrating at times, scary and whatnots but you have been assuring me and not judging my honest thoughts and fears. It is the happiest because you have seen me disheartened, maddened and back up. Since we were young and now we’re a bit older, thank you for weathering the different seasons with me. I thank God that He has given me a complete family through you. Wherever you are, there my home is. Journeying with you, the gloomy seasons do not seem so dark and the sunny seasons seem brighter. 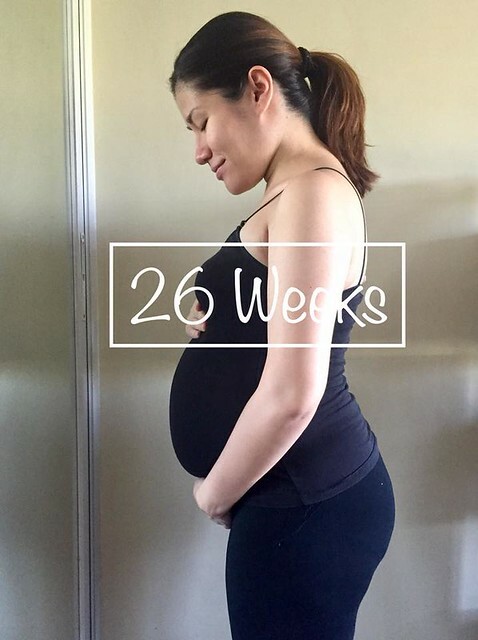 My due date was fast approaching and I prayed for the following things. 2. That my sister (staying in SG) will be able to see Greyson since she will just be home for a few days. That my aunt’s family who came home from the US will be able to see Greyson too since they will be staying for just 3 weeks. 3. Normal, safe delivery and healthy baby. We were scheduled for check up on Thursday June 7, 2018 to check if I was dilating. So far baby’s head is engaged already and we were just waiting if my cervix would open. Prior to this we have been walking and walking and doing some squats as to facilitate labor quickly. I was instructed that we go to the delivery room if any of the 3 conditions happen -bloody show, contractions, and water breaking. 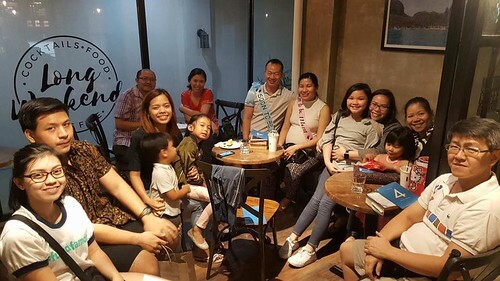 June 6, 2018 We visited our friends, brother and sister Ian and Sheena in their new home and also to congratulate Ian and Joan as they just had their wedding in Baguio which we were supposed to host but we are scheduled to give birth around their wedding date. I had to go up a flight of stairs (maybe this triggered my labor! :P) and then chatted for a while with our friends. I noticed there was a dot of blood when I went to pee, but it was so unremarkable that I brushed it off. I mentioned this and joked that maybe tonight is the night I’ll go into labor! We left their house and had dinner at Alex III. It was pouring during that time. I remember telling Jason what if I go into labor and it was raining this hard, maybe we should go to St. Luke’s our bags are packed anyway and with us in the trunk of the car. But since there weren’t very real visible labor signs we went home. June 7, 2018 around 1AM. I got up to pee and went back to bed. As I wrapped my legs around the pillow to get back to sleep I felt as if there was a short gush like pee. Maybe I was losing the muscle and was peeing uncontrollably. I told Jason that maybe my water broke, he told me to just observe. I got up again went to the toilet and there I saw some weird looking material / discharge. I looked up what a mucus plug looked like and yup it was my mucus plug. Shortly after water with a tinge of pink came out and it wasn’t like the movies wherein water would pool at the floor! It was just some drops on the floor. I told Jason that my water broke. I texted my OB. I was so excited! Could this be the day? I still remember my excitement and anticipation! I was trembling in excitement. I was excited to go into labor to really experience how it feels to push, to finally see my baby!! Jason finally got up and I took a shower and we prepared our snacks. By around 2 AM we reached St. Lukes QC. It was raining lightly and there was no traffic – an answered prayer! 2AM : I went to the Delivery Room at the 2nd floor bringing with us our admission order by our OB Dra. Jing Fernandez. I told them that I think my water broke. I was instructed to wear the hospital gown and the first IE happened. To be honest if I were to rank pain it would be in this order 1. Breastfeeding 2. IE 3. Contractions. That was how painful the IE was of the resident doctor huhu. It was confirmed that my water did break and I was already 3cms dilated (didn’t feel anything up to this point). Actually the IE I think depends on the doctor, the other resident doctor’s IE was uncomfortable but not painful. 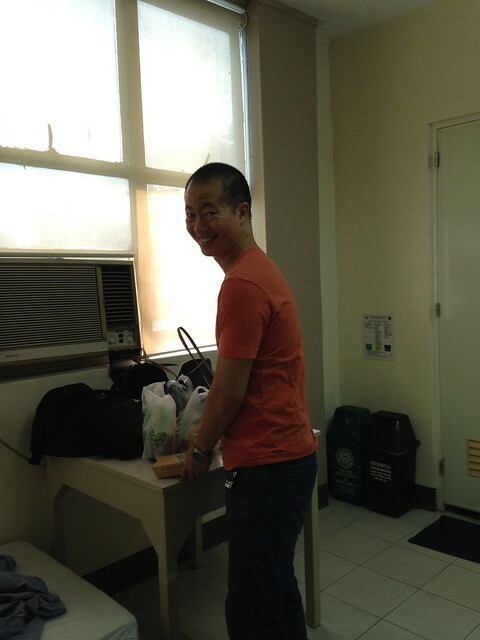 4AM : We were transferred to the High Risk Pregnancy Unit since our request was that Jason join me. They gave me antibiotics thru IV and I was just laying down the whole time. Jason got some coffee. 5AM : I was able to sleep since I didn’t feel any pain still and around 545 an IE was done again. 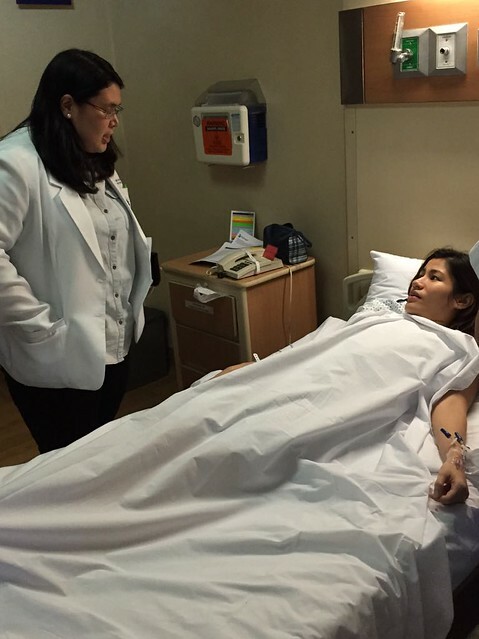 6AM : I was given cervix softening meds – Buscopan? (3x during the day) From this time until the afternoon nothing really happened I was just laying down and watching TV. My mom arrived and there wasn’t really much action going on. I was still able to eat light food, it was a bit boring just waiting for things to happen. I wasn’t allowed to stand up to walk so I was given a bedpan. Doc Jaycee, my ate’s friend who so happened to be mentored by my OB Dra. 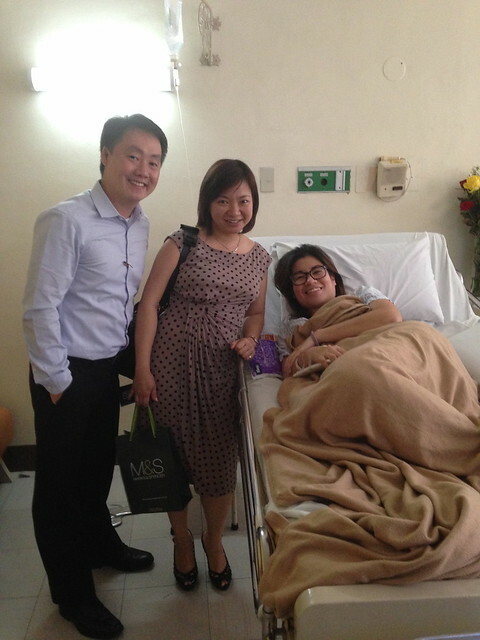 Jing, visited us during the day to give tips and encouraged us when labor happens and to stimulate contractions. She also advised that I need to reserve my energy to push during labor. 3:30PM : Around this time I felt some contractions and when I timed it, it was between 3-5 minutes for around 30-60 seconds. It was tolerable, I need to remember the cleansing breath (this was all I remembered in a free birthing class we attended). I was 4cm dilated around this time. 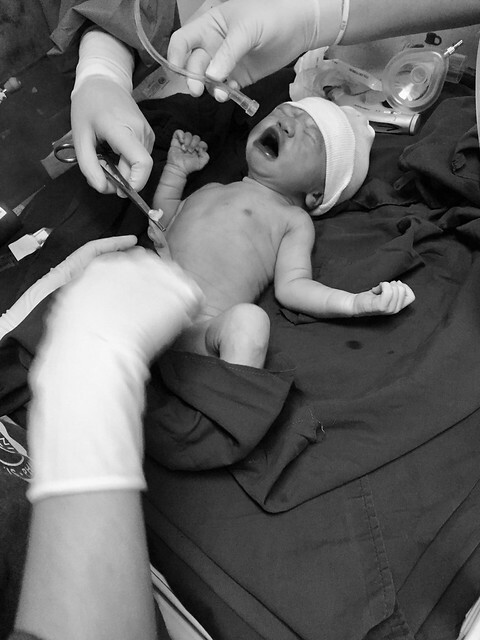 6PM – Induced : Finally Doc Jing arrived and induced me with Pitocin to speed up dilation and contractions. I was on a catheter too around this time. 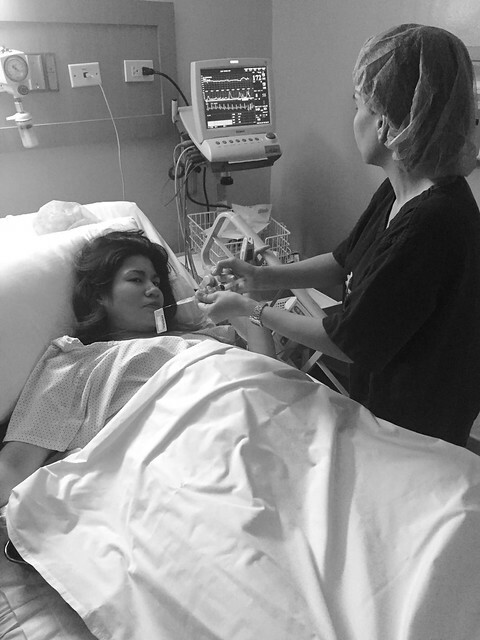 9PM – The intense contractions came : Then came the painful contractions! Even if I tried to breathe it was tolerable but I guess anticipating the pain made the pain worse than it actually is! I asked for epidural and my anesthesiologist, Dra. Marzo came around 30 minutes later, good thing she just lived nearby and she was able to arrive soon! I was asking Jason for lower back massages to distract me from the pain. I was already 5 cm dilated! I guess when Pitocin was administered it did speed up the contractions. They wheeled me out of the HRPU to the delivery room to administer the epidural. The delivery bed was narrow I felt I was going to fall off with my huge belly! They instructed me to do the fetal position it was so painful to hold still, a male assistant had to hold me still in the fetal position but I really couldn’t! So I was instructed to sit down instead. This was so much easier to be in a crouching position and Dra. Jing was holding my hand during these moments. As soon as the epidural kicked in WHEW! I felt that I could go on and push. I was like BRING IT ON! Haha. It was a bubble though because I was given a few doses only so I can feel the next dilation coming along! 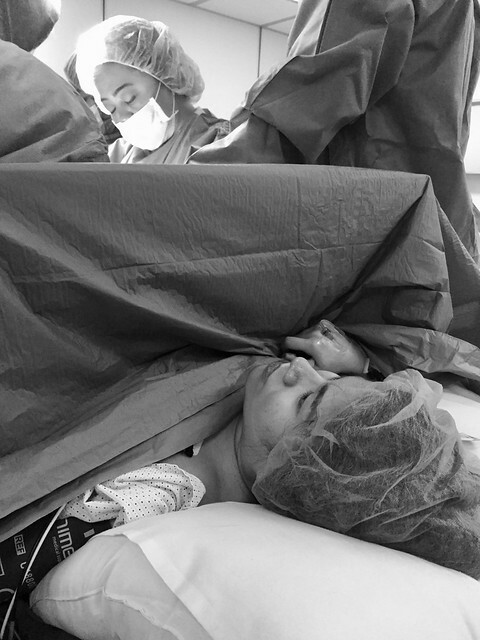 The epidural wore off as the centimeters got wider and as the pain intensified I just gave in and asked for epidural. 1AM at 7CM : It has been 24 hours since my water broke but I was still at 7cm. The progression was very slow but I was successfully dilating. 3AM at 9CM : I was finally 9cm! But baby’s breathing dipped a bit with my contractions. But the belt that was strapped to my waist kept falling off / it had to be readjusted every so often so… This time Dra. Jing told Jason that I had to undergo CS because of baby’s breathing. At this point I was a bit disappointed because I really wanted a normal delivery and I wanted to experience the pain of delivering normally! But I also wanted to see our baby and his safety is a priority! 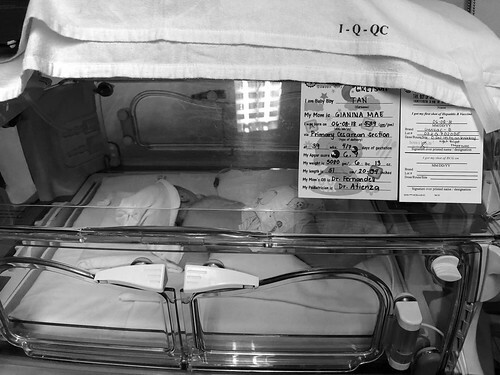 4AM : I was wheeled out once again into the Delivery Room. Dr. Marzo gave me more anesthesia and Jason followed soon after. 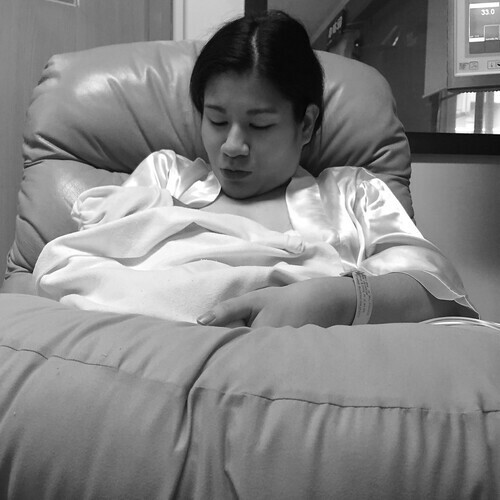 I was sleeping some of the time during the procedure due to the anesthesia. Before Greyson came out, Dr. Marzo told me I would be feeling a pressure! I didn’t realize it would be so hard and intense! They were pressing on my chest and my brain was telling me I should panic because I had a hard time breathing, but because I was a bit groggy I was calm. The pressure was because they were pulling the baby out. 5:39 AM : FINALLY BABY IS OUT! 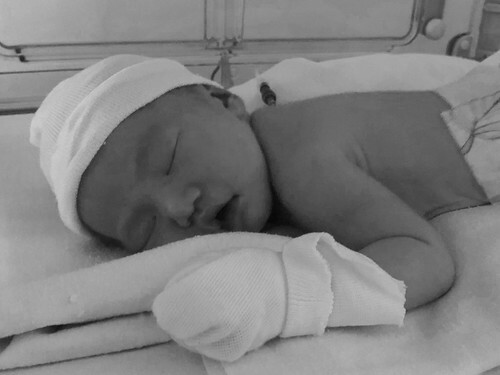 Greyson Maddox Tan was born on 06/08/18, a combination of our birthdays… Jason was born on 06/16, I was born on 08/08. 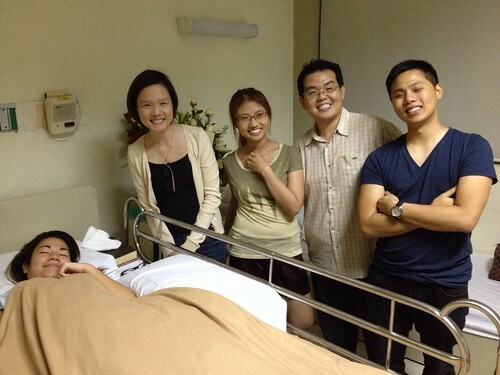 But when Greyson was pulled out, he didn’t cry! Meriting him an apgar score of 6. They had to rush him to the corner to check on him and then he finally cried which raised his score to 9. I was a bit worried when I heard “baby out” but I couldn’t hear the cry. They also had to forego the cutting of umbilical cord since they had to check him. 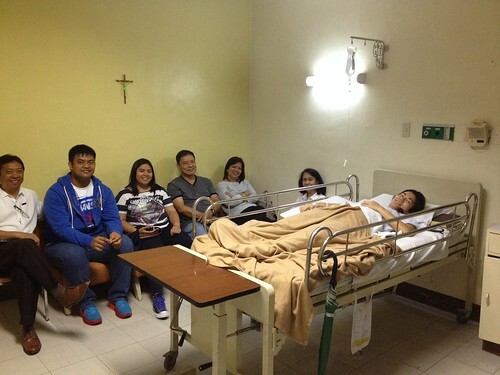 After a quick family picture they rushed him to the IMCU (immediate care unit) just beside the NICU. 10 AM : I was able to go to my room and I was informed that Grey may have some complications due to the prolonged labor. He is presumed to have sepsis and they had to do blood culture, cbc and Xray. My heart sunk. Hearing this was hard to process for me since I thought that I would be able to see and hold my baby right after I give birth and eventually be beside him in the hospital room. I thought that we would go home in just 5 days maximum but we had to stay for 7 days because Greyson was given antibiotics. 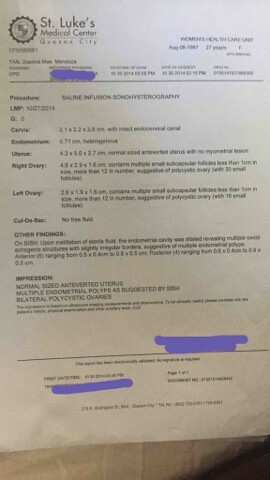 I was hoping that my labor and delivery would be so uneventful like I would just “poop” my baby out and then be on our way home (I just packed for 5 days) but here it was. I wasn’t even allowed to do Unang Yakap because he was whisked off to the IMCU. 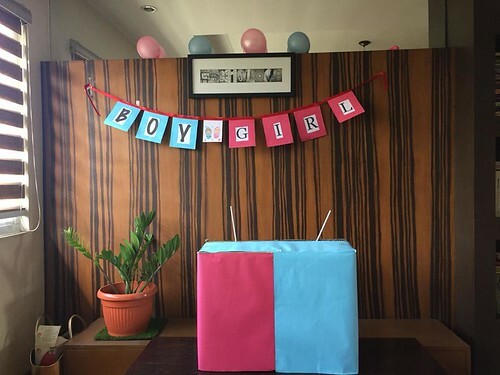 I was disappointed, to say the very least and the room was so quiet as I still stared at that empty space beside my bed on the day of my delivery. I didn’t know how to feel but I felt a deep sadness. 4 PM : I was given morphine to ease the pain of the CS. 10 PM : We were visited by friends – the Disciples, Josh and Corinne . We really appreciated their presence as we were at a loss on how to handle this new stage and also this unexpected outcome that we had no baby in the room! 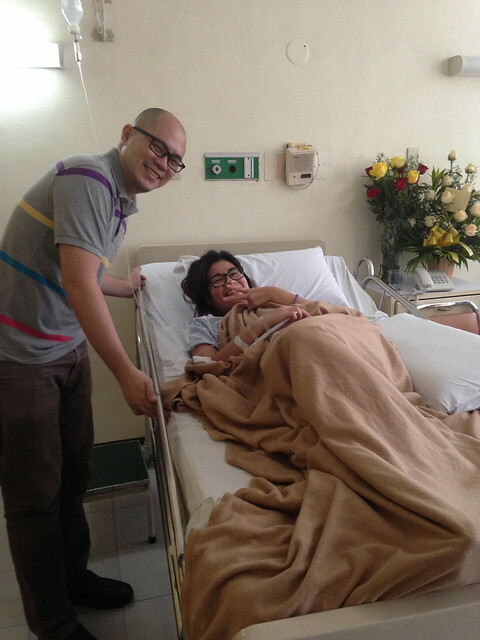 It was also a relief to share how labor and delivery went, our disappointments, and frustrations. We were also very thankful that they prayed for us as we were at the most confusing time in this season! I thought about baby and this gave me the courage to immediately stand up from the bed and visit him at the IMCU. I thank my aunt from the US who helped me stand up and recover quickly. Jason was the first to visit baby and he was able to do KMC. I asked him how baby was and I got a bit envious he was able to hold baby first (no wonder baby is now a daddy’s boy . I was sad I couldn’t rejoice 100% since I had to visit Grey at the IMCU which was totally unexpected. I was also in pain and didn’t expect that breastfeeding would be so difficult! I thought that you just had to stick baby to the breast and that was it! But no…. 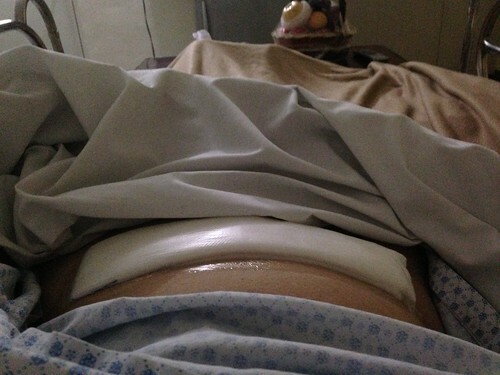 I was also frustrated and felt hopeless that my CS wound leaked so much that it seeped through the many times the gauze was changed and placed – I had to use a maternity pad (that thick and that long) to cover my wound and yet it would still get soaked (then my wound opened which could fit around 5 cotton buds). I couldn’t just expose it for it to dry up because then it would drip everywhere (clothes, floor etc.) and I would probably need so many hospital gown changes in a day. When asked what caused this, the doctors couldn’t explain it and they just said it just happens…though very rarely! It was so rare I didn’t know anyone who had the same situation though I searched so much in online support groups and told people about this. At that time it was the least of my concern as we focused on baby’s well being, and that he should be able to get food from me. But God was in control the whole time and I felt I was being refined and tested in spite of all these. Would I still praise Him? Would I still have faith? Despite all these, I was just so thankful to see my baby and finally hold him. I thank God for answering our prayers and sustaining us, and giving us the grace to endure and also financial providence. For me it was the darkest time – I was in pain all over, we had a baby that could be sick, and who possibly couldn’t be getting enough milk (formula was not allowed at the hospital and we had to keep going at latching, pasteurized milk was also scarce) and who had to go back to the hospital just after 2 days at home. Though it was the darkest time by far, it was also the time I saw God the most. I felt that I was being taught to be humble but God didn’t leave me there broken and discouraged. Whenever I would feel at my wits’ end, He would always come to rescue me. I just feel so grateful. 7 days passed and we thank God that baby was safe from sepsis. Our prayers were answered , he was healthy though just not in a way that we expected it to be. Looking back, I am very thankful how God delivered us from this ordeal. We were not in control of the people, of the circumstances, but He was. 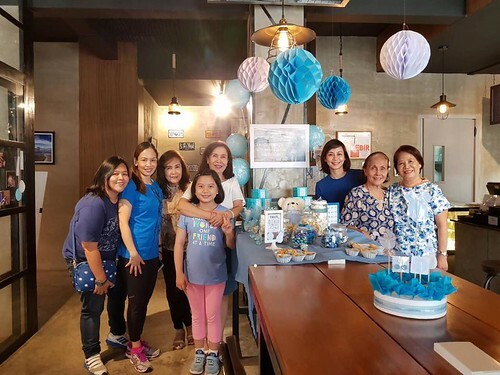 It was also best that Greyson wasn’t roomed in with us immediately because I had time to rest and recover – ready to face the challenges ahead. I was able to sleep and relax and still have my baby taken care of at the IMCU with pasteurized milk initially. 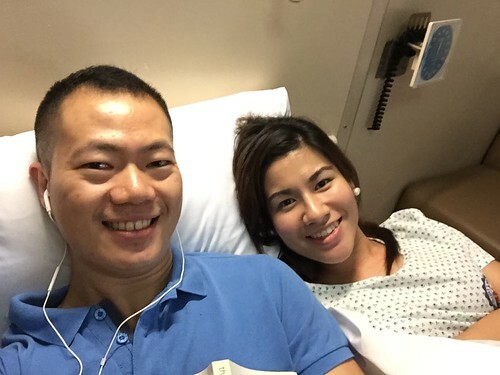 Every time I would feel like I would have a meltdown, He would always rescue me – whether it be thru my husband, my family especially my ate who was emotionally supportive of this new phase in my life, thru friends, for a new found friend and ate in Doc Jaycee, and even strangers like the nurses at the maternity wing. 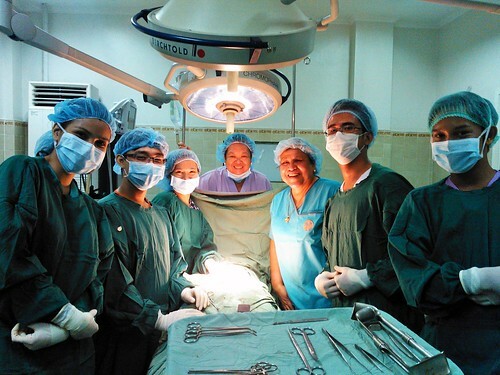 I praise God for them – we had the best mother-baby care at St. Luke’s QC because of the nurses and staff. It was a nursing aid who helped me realize I already had milk which came in on my third day. Gia: The final stretch has arrived and we couldn’t be any happier. On the 30th week we wanted to have a glimpse of our baby in 3D/4D but Greyson didn’t want to show his face completely! So the ultrasound was a fail and the sonologist said it was really chance and luck that parents see their babies on 4D . After my first check up in the third trimester, we ate outside and I chipped a tooth and swallowed it. It was just the beginning of the disaster to follow. As we went home that Thursday night my stomach had a violent reaction, I was throwing up and having diarrhea. I didn’t know if it was the food or my tooth, but it was the worst. I was so worried about Greyson and I could only pray that he was okay. I couldn’t take meds and my OB just recommended that I drink Gatorade only to hydrate myself. Praise God that the following day – Friday , I was relieved of this condition. That Saturday, since everything was relatively normal, we went to church to serve. Then I experienced weird palpitations that I had to go to the clinic to have my BP checked – it was normal. Plus I had a headache and some pain in my jaw, shoulders and upper back. It was the first time that I felt it and I couldn’t sleep the whole night. I remember praying and asking Jason to pray for me because I was panicking and I was palpitating. Jason: I’m not good with first times. My wife knows this and God surely knows that. So we had a delivery room dry run one Sunday when Gia felt some palpitations and muscle pains which made her lose sleep that night. It was a false alarm, but we had the experience to test the traffic, the D.R. service – where to go and what to do. It was a nice experience and both of us reacted calmly and we were in a good mood during that experience. We praise God that the baby is okay and that my BP is okay. It was concluded that I was overfatigued (maybe due to diarrhea), muscle pains were due to my heavy bag and the dental activity earlier that day (wherein I had to open my jaw for a long time.) Whew!!! 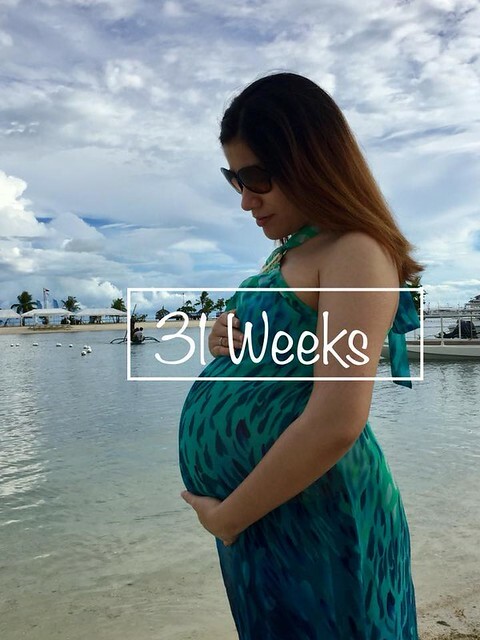 Our last vacation was a plane ride to Cebu, a final rest and recreation before we become three in our family. Everything was smooth, from the airport to the resort and the experience was quite good. We were able to have our quality time. It will be different after the arrival of the baby. But it will be different in a good way and we are excited for the next level. The next stage of our adventure. Family life. We had our babymoon in Cebu. Because we knew that it would take us some time before we can travel again – just the two of us. More on our trip in another entry. When I ask Greyson, do you hear Mommy? He moves! all the time, Jason would testify! Anxious! I could not rest when he moves and I am worried when I don’t feel him moving – I would poke at my tummy or drink cold sweet juices. 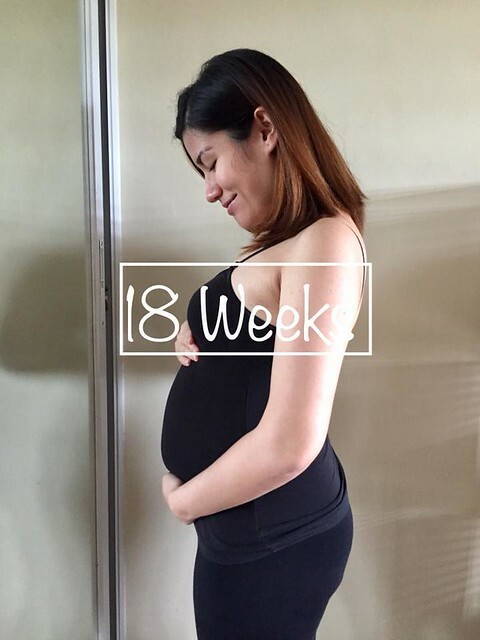 More trips to the CR but I could control it this time unlike the First Trimester wherein when I felt like going – I really had to go!! During our check up, it dawned on us that I can give birth in 5 weeks!! Whoa. We went into panic mode. 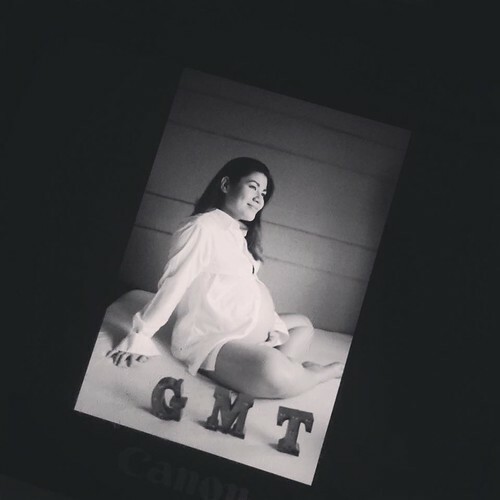 It was still my 7th month but I felt so unprepared! 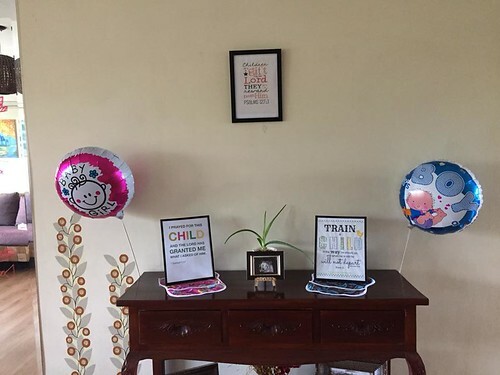 We were supposed to host our baby shower / thanksgiving party with our family and close friends but we realized that it may be too late to plan it already. I could give birth in my 8th month. Plus we haven’t bought baby stuff yet. We suddenly rushed out to buy some baby items just to get started. 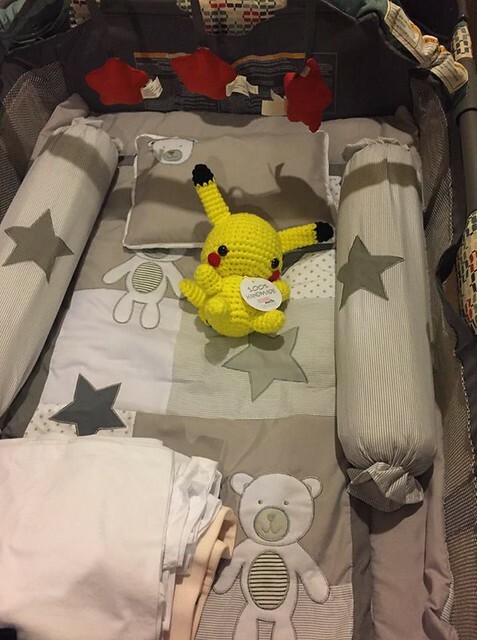 First thing we bought – pack n play Crib! Our generation has made having a baby so overwhelming! Praise God for family and friends who went ahead of us, we had so many free hand me downs on baby stuff. We also started to fix the baby room. 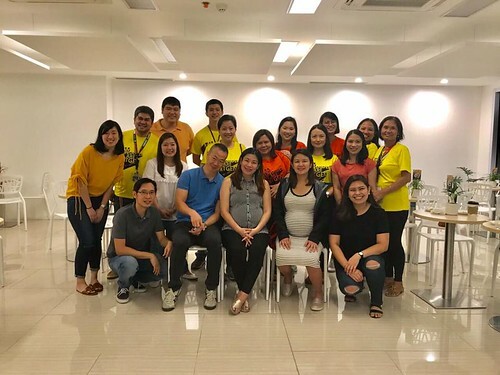 I thank God for sisters-in-law, Ate Christie and Maica who gave and lent us baby clothes and even baby products like a baby carrier and Smart King stroller. It saved us a lot! I started nesting as soon as I received this and I started daydreaming about baby again as I held and folded the clothes that he would be wearing. 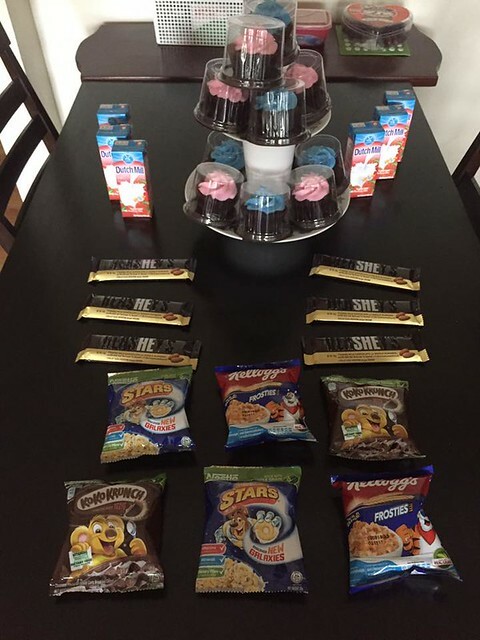 We are thankful to SNKC family who threw us a surprise baby shower on our last day before we take a leave! I was really surprised I didn’t know what was going on but we are thankful to them. 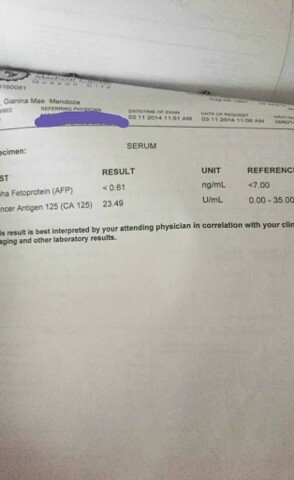 The last week of my 8th month, we did a final urinalysis test to check for protein and sugar and it came out normal! 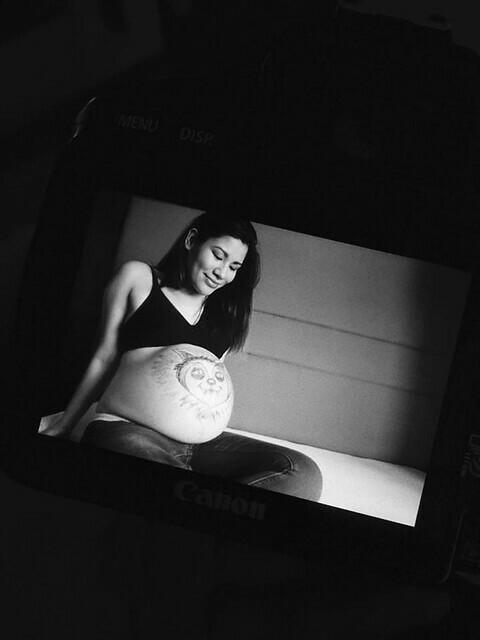 I was pretty much healthy during the whole pregnancy and I thank God that He has protected me and my baby. It was an answered prayer. Sure there were hiccups but it only taught me to trust in God and depend on Him. I did not have any control of this pregnancy and I could only do what I can, but He is sovereign. *Began walking in malls to initiate labor! In 2013 when we got married we were advised to start conceiving after a year or two. But a lot of things has happened since then. and a minor surgery in 2015. After 4 years of trying to conceive, we had to check on Jason after my procedures were done. We found out that he had to undergo surgery too due to Varicocele (this condition produces abnormal and unhealthy sperms). We prayed and fasted at the start of the year and we decided to push thru with the procedure. It was sometime in February 2017 that Jason underwent surgery. I praise God that He enabled me to be in a job that was flexible. It was challenging to do both Jason’s work and my work but I really thank God that He prepared us for this challenge. I saw how we were able to cooperate, to be patient with one another and to be understanding. But we are still growing in these areas. After the Varicocele surgery, we wanted to just enjoy this whole process. And I know it is because of God that we are having joy and peace. 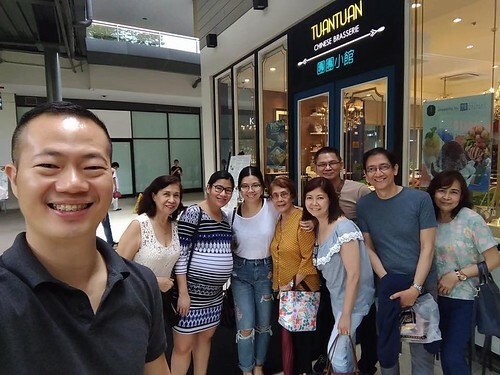 Sure we would long for a child, and we will do what we had to do but this time I told Jason, I’m enjoying this journey with him as we went home smelling of herbal teas from a Chinese herbal clinic. 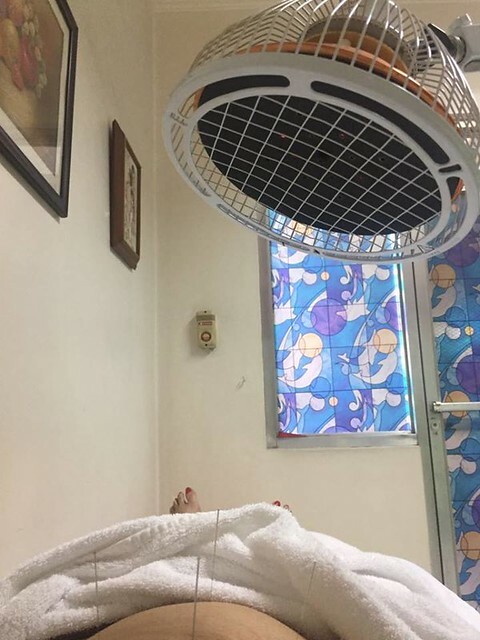 We opted for Eastern medication like acupuncture and Chinese herbal tea since we are diagnosed “The unexplainable” with the doctors we consulted. I haven’t tried those and I’m excited actually. The acupuncturist and herbalist diagnosed me differently. In acupuncture, I was said to have a cold uterus and I needed to drink warm water and coffee was a no-no. 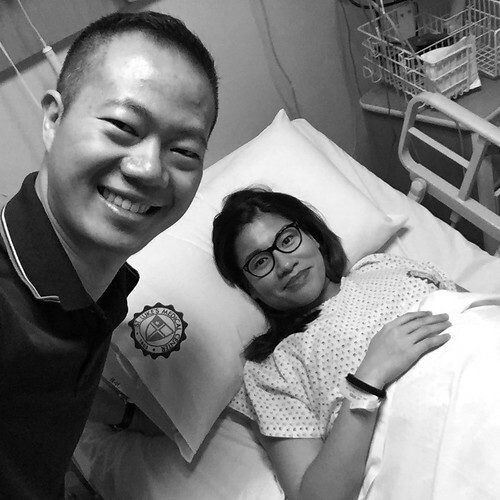 In the herbalist’s clinic, I was said to have a warm uterus and my tongue indicated I had poor health and my kidney was weak and so was Jason’s. In my first acupuncture session they said I would sleep soundly! But I barely slept a wink and was tossing and turning the whole night! I poked Jason and he was sleeping soundly. 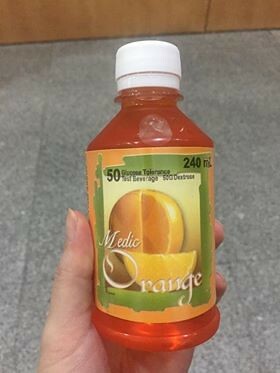 Ang sarap ng tulog! I just looked at him in disdain. hahaha. Di daw kasi ako Chinese that’s why walang effect. GANUN! hahaha :p I reported this to the acupuncturist on our next session and she told me she probably touched some nerves that gave me too much energy. After the second session, I still couldn’t sleep. We asked how long should we do these sessions? She said until I get pregnant. engks! It was expensive and what if if took us 3 years. Then this would be draining our pockets with no actual diagnosis and we wouldn’t know what we were curing in my body. We moved to the herbalist next and this time we had to boil tea for 45 minutes in the morning and at night. Our house smelled like burnt leaves. I would meet my clients and my perfume would be Chinese herbal tea. After 2 weeks, Jason decided to discontinue because his tea really tasted AWFUL (for a Chinese used to drinking teas. hmp :p ) To be honest I was getting used to the taste and I didn’t mind waking up early morning to boil both our teas. But it was the same.. we needed to continue doing this until we get pregnant, not to mention it was more costly than the acupuncture. We thought it would be less expensive. 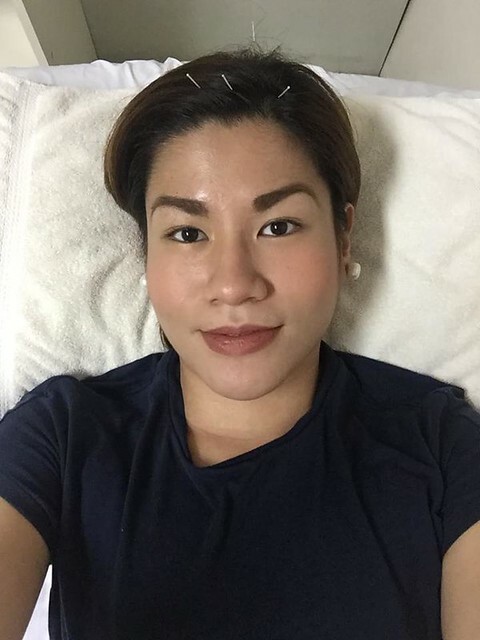 😛 Sana acupuncture nalang. In the midst of all this, we decided to serve together and prepare to partner in discipling kids through sports! We also began serving God in Kids church while we waited on Him. I am so glad with the opportunity! It is an answered prayer that I get to serve alongside my husband. I remember when I got married in 2013, I keep telling my single friends that I regret not being able to serve God. Of course when you get married, time gets limited with wife duties / family duties / work duties. Years after, I was so happy that God still honored that desire and may bonus pa, I was with my husband. It was a fun season for us. One by one our D12 mates were getting pregnant and I couldn’t be any happier for them! Back when we got married and after my painful surgeries, when I heard news about people getting pregnant it caused me joy and pain. But this time I can say I was really truly happy for these people who have grown to be my friends. I was excited and kilig with their journey. They also had their time of waiting on God and finally God has blessed them. It gave me hope that one day, in God’s perfect time and in His own perfect way, we will also cry and rejoice and be expecting our child as we wait on Him. We planned for Korea for honeymoon on November 2017, booked and all. If we still wouldn’t have a child, then we would just keep adding to our adventure book and travel. We also went to visit my OB one more time since my mid-cycle bleeding has returned that year and we wanted to check if it could be hormonal / my polyps have grown again. 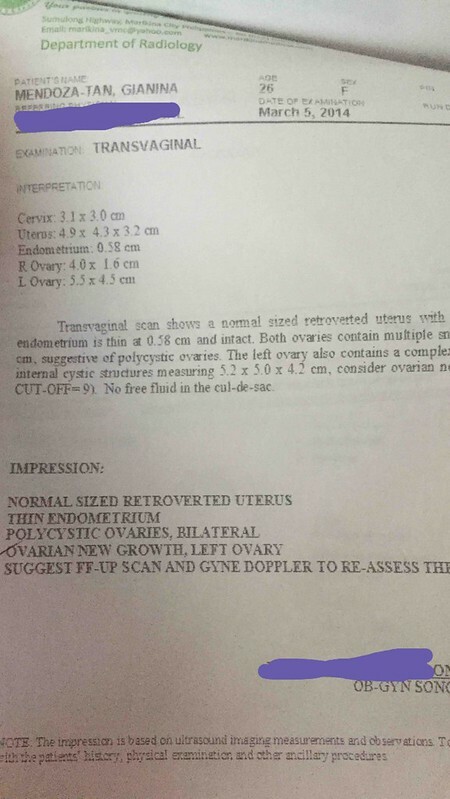 So we went back to my OB to report about my situation. I got my thyroid test done and was negative for hypo/hyperthyroid. Still our doctor couldn’t explain why we couldn’t conceive. It seems as if we were healthy already but couldn’t diagnose our situation. I was given another dose of Clomid and a shot of follicle stimulating hormone in my belly, and of course it was recommended we set aside time to be intimate with one another. During that “get busy” week I still had my mid-cycle bleed that never left me! and I remember the story of the hemorrhaging woman in the bible. As she touched Jesus, she was healed and her faith has healed her. How i prayed that God would stop this bleed and heal me and would open up my barren womb. We tried to schedule our intimate times but it was really difficult because we also had our commitments in work and activities. On our “appointment day” something came up and we got so swamped and we had to let it go and just try the next day. To be honest, I got mildly irritated for a split second but then resigned that if it is God’s will, no matter the day, hour or minute! it will happen for us. Sometime September though I noticed something a bit different, but I concluded and even wrote down in my journal that my period could be coming. Sharing with you my personal journal. Days leading to October 10, 2017, these verses stuck to me. John 16:24 You haven’t done this before. Ask, using my name, and you will receive and your joy will be complete. Every time I have my devotion / quiet time with God we ask Him to prepare us to be godly parents that He wants us to be. That I would be able to conceive in His perfect time. 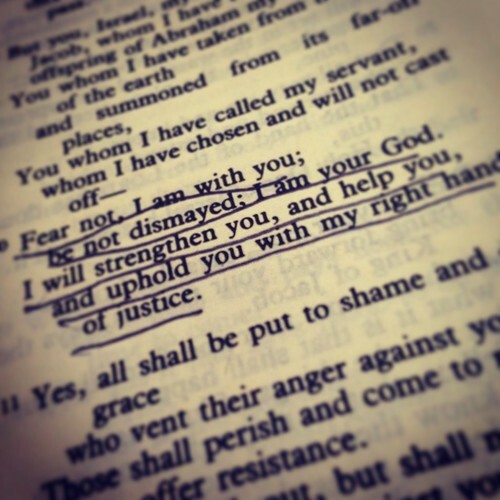 Then these verses came to me. Will I be having my period this time or will I not? I was feeling some things but of course I can’t be sure. I’ve had a delayed period several times but resulted in a negative pregnancy test. This time I was still feeling some cramps and other things. I kept my hopes up and I stumbled upon the following verses in Proverbs. Both say that the hopes of the godly will come true, and will result in happiness. But at the same time the fears and expectations of the wicked will come true. I pondered on this and told myself, “Siguro if I still have a negative pregnancy test, maybe there is still wickedness in me that needs a heart surgery, that I need the Holy Spirit to reveal and transform in me”. (ni-literal???) Ouch. How did God see me? Was there going be another test for me on humility? I praise God for my husband, my spiritual leader, that not once did his faith waver. He was steadfast in his belief that God will give us a child naturally. He always assured me of this and I do not know how he can be so sure? But maybe a long time ago a vision was planted in him of having a family and he holds this promise close to his heart. That no matter what happened he believed. I was expecting my period on October 1 but maybe because we had a family outing and my routine was off, it did not arrive as I anticipated it! A few days after it still hasn’t arrived. Well it didn’t happen the first time. I’ve had cycles where my period would arrive on my 39th day when it was supposed to be between 29-35. Anyway, I still had 2 pregnancy tests at home. We always stocked up in hopes that one day, one cycle I would get to see my own two red lines and not just in google. I prayed that if it is God’s will He will allow us to experience unconditional love and love our own child the way He loves us. I decided to take one after a week of missed period. We were scheduled to go to the Korean embassy on October 10, Wednesday early early morning to apply for our Korean visa. I woke up around 4:45 AM bringing the pregnancy test with me to the bathroom. As I collected my urine and dropped it on the test I sat sleepily on the toilet to wait. As the color creeped slowly, one line appeared and after a few more seconds… another red line showed up. What is this?? Was I dreaming? Did this come from my pee?? If only I could tell you how I trembled and cried and praised God for this seed of life growing inside of me. To experience this miracle, it was the happiest morning.. This time I ignored him (padrama effect!) I hid the PT in the other room and got my phone. Of course this merits a documentation! I cried, we hugged, and got ready to go. Praying and thanking God in the car on the way to the embassy. Through it all, nothing compares to the joy and the experience of knowing God more in this journey. Of being comforted by Him, of being assured by Him through His words and promises, of knowing that we can have hope because He hears us and loves us. Be my best wherever God brings me / leads me. My worth is not my ability to produce children. You are a woman, a child of God and gifted by Him with unique abilities that only you can do. There was a time that I did feel tired about waiting and putting my life on hold waiting for something I wasn’t sure would happen. But a question was left in my heart, What was I doing with what God has given me at the moment and where He has placed me? As a wife, was I striving to be my best? In my work, was I working at it with all of my heart? Was I pleasing God? Serve God and seek His will. What am I doing while waiting? Were my intentions pure? Even if I am not a mom yet, was I preparing to be the mother He wants me to be? and What does God want me to know about myself and Himself during this time of waiting? Do our part. We had our part and God has a part… We were convicted to do what we can naturally. This 2017 we excused ourselves from the organizations we joined so we can sleep early. We used to sleep around 11 pm / 12 midnight. But that year we made it a habit to be in bed by 8pm. We also became diligent with working out and eating healthy – cutting back on sweets and junk food (for me). I was now eating oatmeal (which I hated) during breakfast. We also sought ways to cleanse our system may it be herbal tea. Really Jason would agree that my lifestyle has drastically changed – from just popping anything I see to eat in my mouth to being conscious, and from hating any physical activity to having fun sweating it out! (sorry I just had to insert this, I was not really into healthy stuff but by God’s grace He is convicting me that I should be a good steward of this body). Also we went for check ups to make sure that our systems are okay. Surrender our desire to God. God knows what we want even before we admit it to ourselves. Sometimes we tend to deny our real wants and desires but God knows it already. However much I wanted to control things and set a timeline, God knows what it is best for me at this moment. He understands me and yet His will is perfect. He loves us so much that maybe sometimes giving in to our desire will do more harm than good for us. When He enabled me to surrender my desire to Him, He just made this story more beautiful than I can imagine and even imagine to write about. 5. Nothing can stop the will of God. During this season of waiting I have come to know a lot of women who shared with me a lot of seemingly impossible situations on conceiving. Be it one ovary, blocked fallopian tubes, having myoma, having cyst, a degenerating uterus and yet when God said it is time, nothing is impossible with Him. During our conception, I still had my mid cycle bleeds which I still don’t know the cause of, and yet the conception happened at God’s appointed time. I thank God and praise Him for this journey. Truly the blessing of waiting is God Himself. And I know that this child, He has given and not on our own effort and strength. No matter what herbal tea, acupuncture, medication and condition. As a beloved pastor said, this is just the beginning. Even in my Pru Life uk business, yes we are entering the looooongest stage in our lives. It is daunting but I am also excited to receive His promise, and what God has in store for us. 8 Be careful to follow every command I am giving you today, so that you may live and increase and may enter and possess the land the Lord promised on oath to your ancestors. 2 Remember how the Lord your God led you all the way in the wilderness these forty years, to humble and test you in order to know what was in your heart, whether or not you would keep his commands. 3 He humbled you, causing you to hunger and then feeding you with manna, which neither you nor your ancestors had known, to teach you that man does not live on bread alone but on every word that comes from the mouth of the Lord. 4 Your clothes did not wear out and your feet did not swell during these forty years. 5 Know then in your heart that as a man disciplines his son, so the Lord your God disciplines you. 6 Observe the commands of the Lord your God, walking in obedience to him and revering him. If you are still waiting on God for this blessing, i would like to pray for you and encourage you that God can be trusted and He keeps His promises. We don’t know the reason why He gives, why He withholds but He is good and He desires what is best for us at this time. It will not be easy but give your burden to God, He cares for you. Our life is just so short, may we all experience the joy of coming to know Him truly in this lifetime. In the previous post we shared how we went through looking forward to conceiving and yet we found out another more serious thing happening. 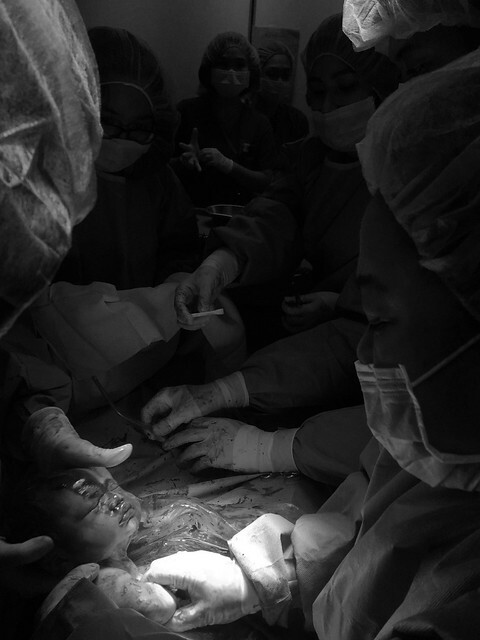 The recovery was difficult I already felt like I had a cesarean section. So I guess this is how it feels like. Staying at home post operation, I was plagued by negative thoughts that this pain I brought home would be worth it if I had a baby to look after and I would often sulk in self-pity. Looking back and reflecting, I feel like an Israelite. God has just answered our prayer, and here I was. He is about to lead us into the promised land but there are lots of delays because He is purifying our hearts and motives. Jason didn’t mind that we didn’t have a child and he was confident in God that He would bless us one day. But me of little faith.. I was skeptical. He would often assure me that he married me for me and not because of a baby. I would cry and be assured for a while but it would still hurt. 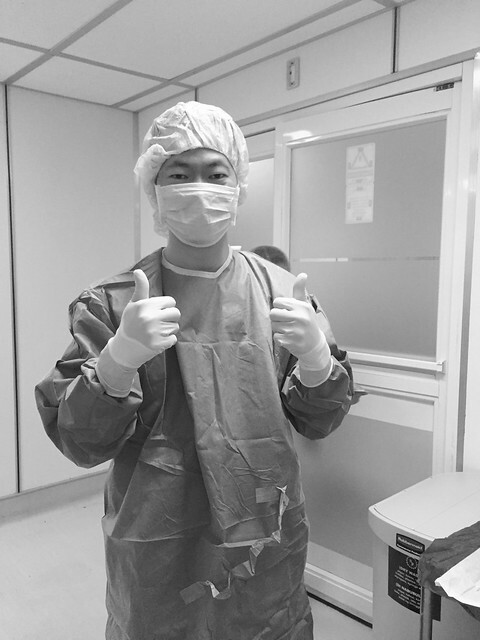 After the operation, we started looking for an infertility specialist. 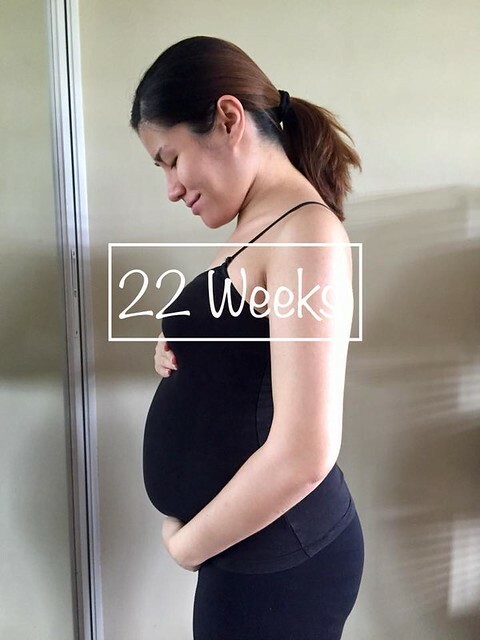 We really preferred our doctor in UST but we considered the distance should our pregnancy push through. According to the OB-gyne’s if we cannot conceive within 1 year of trying, we are considered infertile. The word infertile was so hard to swallow. It was really a blow. I was hoping that by some miracle that year I would get pregnant and prove the doctors wrong. How can we be infertile? I believe we relatively had a healthy lifestyle. I was still in my 20’s, we don’t have any vices and we would sneak in a gym workout or two in a week. Whenever people ask us if there was anything wrong with us, we just say I had an operation, maybe it was it, and we wanted to believe that it was just that and the problem was solved. A lot, though well intentioned, would offer their theories why and sometimes it would upset me because I feel that we are doing what we can. We went to an Infertility specialist and she recommended me to take Clomid for about 3 cycles and monitor my follicle every mid-cycle and of course we had to do our part and get busy. We kept track of the days and at times it would get so stressful that we would get irritated at one another. And at the end of the day it defeats our purpose. I remember Jason would tell me, “If ganito lang, huwag na lang”. In his mind the baby should be born out of our desire and love for one another that naturally we would conceive because we were filled with love – not spite or any other reason for that matter. I was taken aback but realized it was true. When I dug deep, I was so filled with pride and control issues that God was breaking me. As for the test results, it turned out that I had a dominant follicle meaning I was ovulating and ready to conceive. But we still weren’t able to despite the 3 monthly cycles of Clomid’s and the “schedulings”. I got tired of putting my life on hold. I felt that I was prepared (but this was just my feeling), but God wanted us to wait on Him. He was also dealing with me, with my insecurities, my feelings to please people, to give in to the pressure around me, and just for me to be joyful in Him whatever the circumstance may be. Was the child more important than Him? Was the gift more important than the giver? During those times I noticed that I had some abnormality with my period that I would often have one mid-cyle. I was required to do another procedure. I underwent SISH where saline is infused in the uterus. 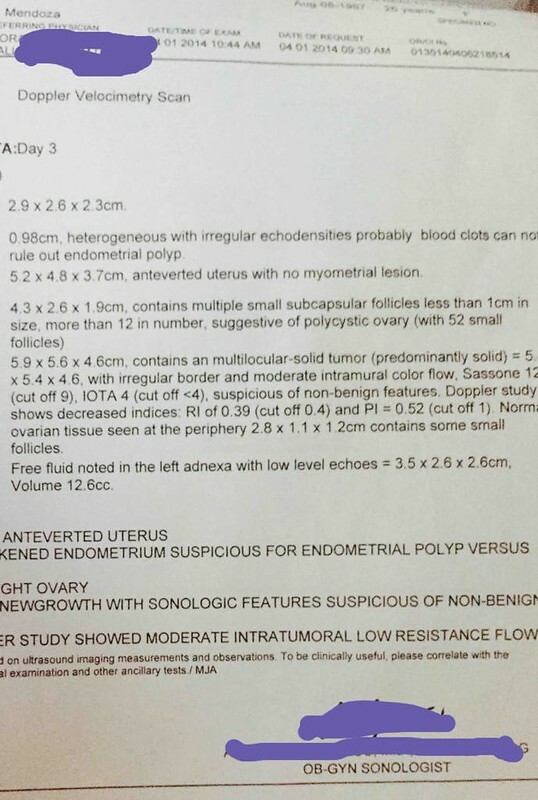 We found out that I had multiple endometrial polyps. We consulted another OB (and we’re staying with her until now!) who is also an endocrinologist to check if I had any thyroid problems / any hormonal imbalance. According to her, this would be an obstacle for the sperms to reach its final destination 😛 Looking back I saw that my past ultrasounds indicated that I do have polyps but it was overlooked since the cyst posed a much bigger problem. I had to undergo another operation but this time it was minor. It was similar to a D&C. I told Jason I want to write about this, but he told me then to preserve these moments and in time I would be able to tell this story. We took some time off and then proceeded the following year. Because of the 2014 operation, this one didn’t seem so scary. It was still very fresh in our memories. I am very thankful to my mom who was with us to help with all our paperworks because truly we would be at a loss. 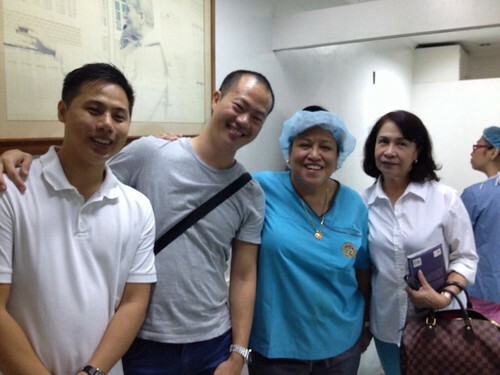 We checked in during the afternoon and I was happy to see my doctor friends who were at St. Lukes that time. Nakapagchika pa kami. Thank you for dropping by. Even if I went under the knife and became a certified “operada”, I was still afraid of the needle! 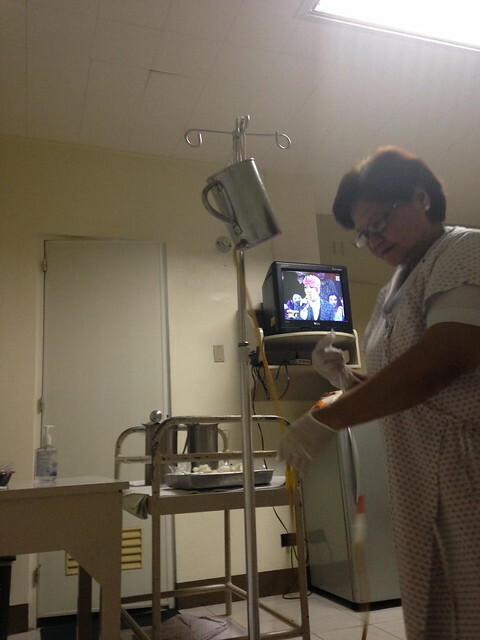 I even told the nurse, dahan-dahan lang po ah takot ako sa needle. 😛 He went there for the IV. After which, we passed some time and listened to some music. Chill lang… to relax us for what was to come. Later on, our anesthesiologist dropped by to brief me about the anesthesia. That it would just be a light dosage and I would easily snap out of it with a nudge or when they say my name, say my name.. She was so funny it calmed my nerves. To be honest I was looking forward to the anesthesia haha – it would be my second time. She told us that she would be meeting us at around 6PM to administer the dose and Dra. Jing would follow. 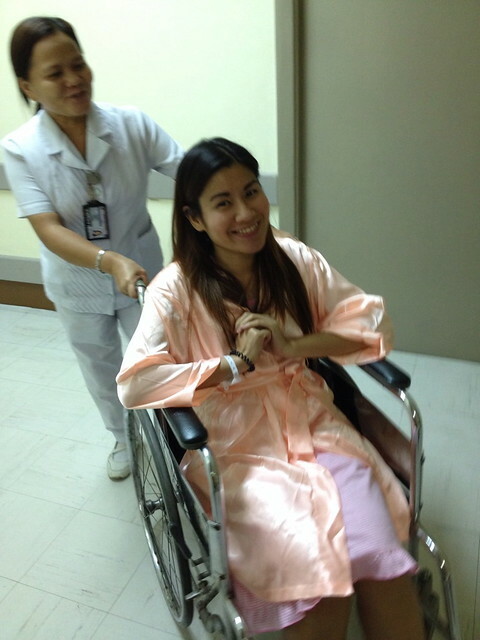 Around 5:30 PM I was wheeled out of our room and into the operating room. The preps were done once again and I couldn’t care less.. Ganun talaga privacy no more. 😛 As I remember nagchichikahan pa kami ni Dra. as she administered the anesthesia. Ang dami ko pa gusto ikwento and was engaging her in a story but just like that…. I was OUT. I didn’t know how long it took but I felt Dra. nudge me and I was having the chills in the operating room. I woke up and there were bright lights and I saw that my legs were apart like I was giving birth. A wave of panic sunk in and thoughts were racing like Oh no, I didn’t know what happened to me but good thing I dozed off again. I woke up in the private room and all was finally well. We checked out the next day and the recovery was very very quick since it was just a minor operation called Endometrial Curettage. I was back on my toes the following day. Good thing too that I had my life insurance and we only paid 36% of the bill net of deductions from Philhealth and SSS. I was again filled with hope that maybe this time it would turn out fine. That time I decided, one day we will have a child and started writing to him / her. 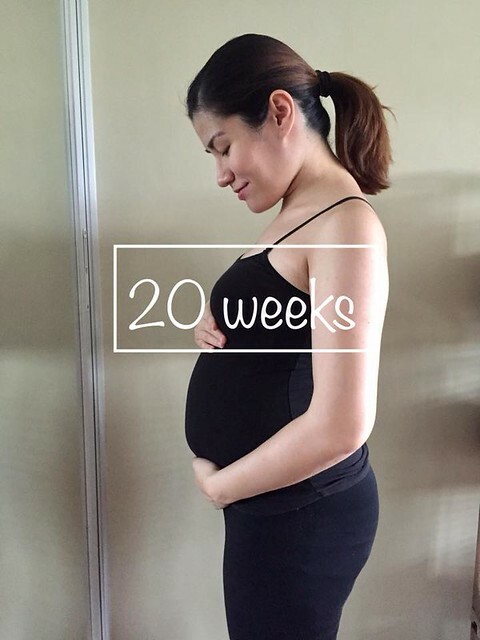 Since 2015 I have written 2 letters to our unborn child and will share in a different entry. 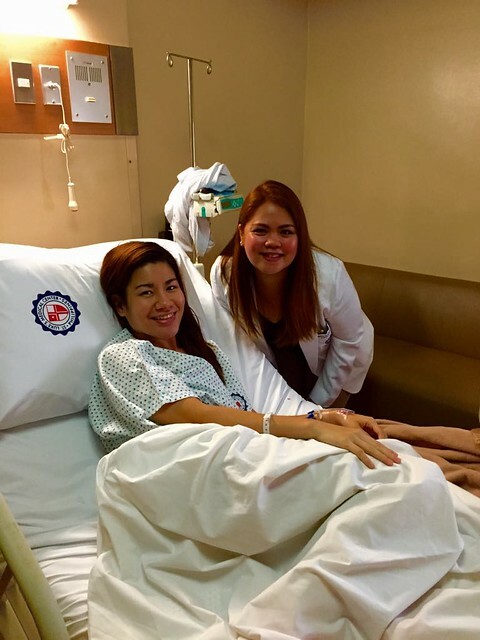 The next step for me was to check my fallopian tubes for blockage but after the operations…. Wait lang. We had to consider our budget too and of course undergoing another painful and probe-ful procedure. We decided that I would just do it the following year. As we went back to our OB, Dra. 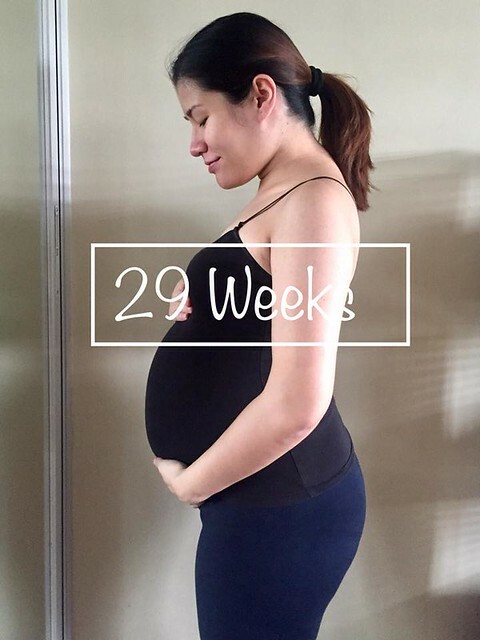 gave us the option for IUI and IVF but we weren’t ready for that. Our doctor would ask “Naiinip na ba kayo?” In my mind I screamed YES. But I blurted out, we can wait. engk. But seriously I was getting a bit impatient. Is this the millenial in me? I’m glad that God was working in me showing me that it is not about what we want but what He wills. The next step was to check Jason’s situation. With his permission, I am writing this. After the sperm analysis test, It turns out that he had less than 4% normal sperms. According to some standard, it takes minimum of 4% normal sperm to conceive a child. His was around 2 or 3%. After a few months it went down to 1%. He was diagnosed to have Bilateral Varicocele. Next we had to do this test to see if my fallopian tubes were blocked. It was a bit expensive so we opted for a nearby one but it still was a maternity hospital. IT WAS SO PAINFUL. I was wide awake the whole time. When I asked other wives who’ve undergone this, they were asleep.. But I was awake and I was only given paracetamol. Aray. Praise God after that very painful episode, the diagnosis was my tubes were good to go. 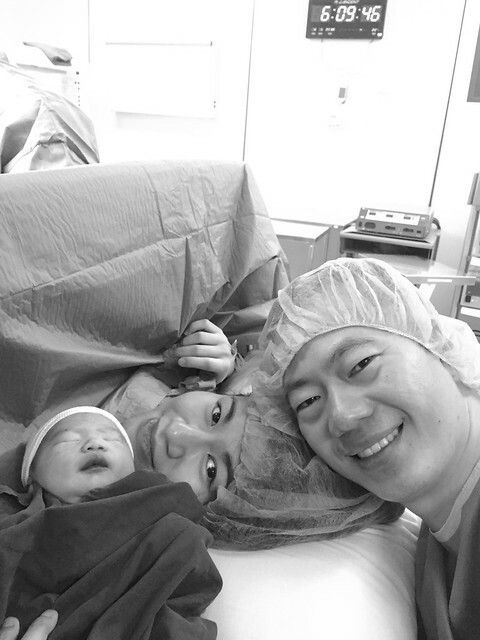 It was recommended that Jason would undergo surgery to cure the varicocele. We just need to eliminate all possible causes and problems. It may improve his normal sperms but still it was no guarantee. 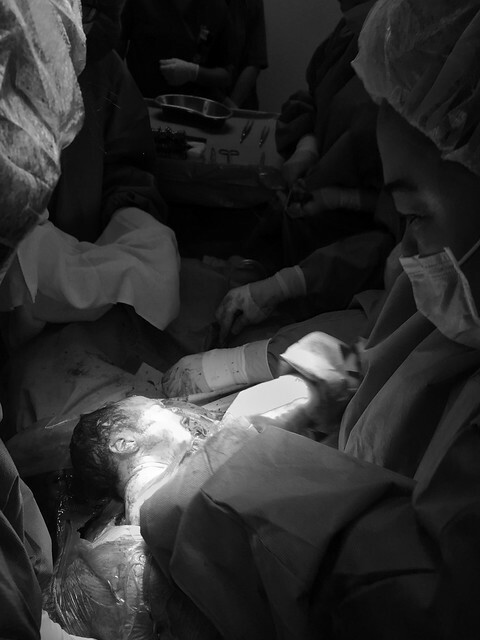 Some even without surgery were able to conceive considering their predicament. 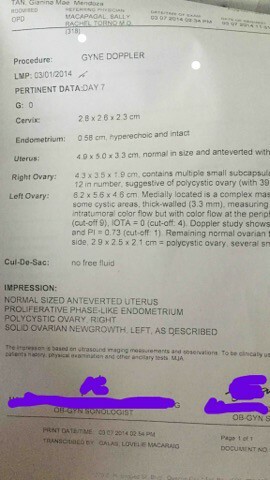 With all the results that came out, our OB diagnosed us we may be one of the cases that are “unexplainable.” Whut? Sounds like some kind of mystery file. I wanted to be aggressive and maybe check the compatibility of our bloods and APAS etc. but our OB does not recommend it because I was not qualified to have one. Our problem was we could not conceive. 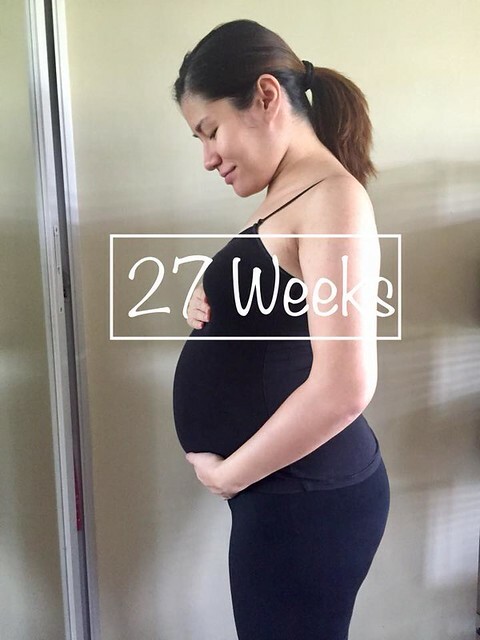 Despite my operations, our scheduling, our Clomid, lifestyle changes. I’m taking light of it now but back then I read this article about infertility and how I would cry and feel helpless and just long for a child to take up that empty space in our empty room. But what can we do? We talked about adopting and we considered it than have IUI. We ended the year still with the question left if we should push through with Jason’s surgery.. I think it was sometime towards the end of the year that an opportunity opened for us to serve in the Kids church. We decided, we will serve Him while we’re waiting. We were just praying for 1 child but how God answers, we would be getting a lot … in Kids church! But will this be it? Last entry in Part 3..
Jason and I got married on May 19, 2013 after 6 years of being in a relationship and 1 year of getting to know each other. We were just kids when we fell in love! 😛 I was 19 and in college and he was 24 and finding his way in the world when we met. See how we met each other in the link below. Finally in 2013 sinagot na nya ako. 😛 Haha just kidding! Our proposal video is below if you dare see. I struggled to say YES to be honest I am a shy and private person and I was embarrassed because there was an audience. That time it wasn’t trendy yet to do flash mobs and such. But I was glad to be there with friends. Anyway that’s not the point of this entry. When we got married, we were advised to just enjoy our married life for 1-2 years before we have a baby. 6 months into the marriage, I felt that I was ready to have a child. But God knew otherwise. I remember I was compelled to start praying for our future child back in 2012 after the proposal. I was given the desire to be a mother someday. I really thought that when we get married and have our honeymoon we would instantly conceive. After our wedding, we took precautions because of the advice of enjoying our marriage first. And then a few months after, we went on our way. I raised my concern with Jason that I wanted to start a family. That time I guess he wasn’t ready yet maybe because of all the new adjustments – getting married, running a house with me, finding our partnership, finding our sweet spot of working together. Despite the apprehensions, he agreed that I needed to check with my OB. So I had a visit with the first of many OB’s. She did a pap smear on me since it was mandatory for married women to undergo a regular pap smear. I thought that was it and then I would conceive. Then I was required to do an ultrasound. I did the ultrasound months after and I changed OB then. 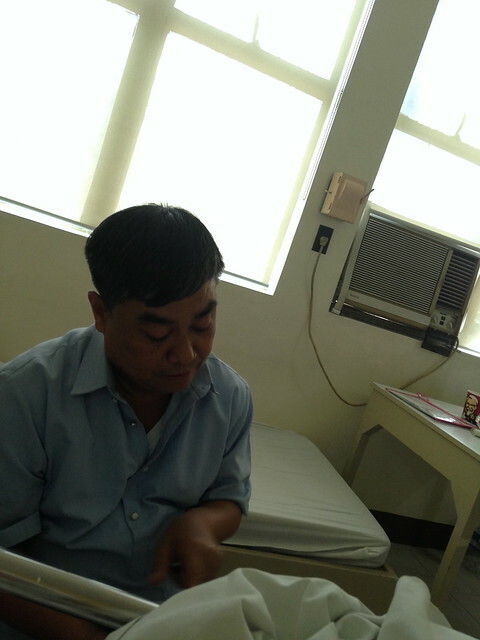 I first did the ultrasound in a nearby hospital, Marikina Valley. I was expecting normal results because I wasn’t feeling anything unusual anyway. When we got the results, my eyes zeroed in on polycystic ovaries. Surprise! I wondered what the NEW GROWTH in left ovary meant. My OB requested that I do another a gyne doppler which was more painful than a regular ultrasound. And still there it was.. A solid ovarian new growth. 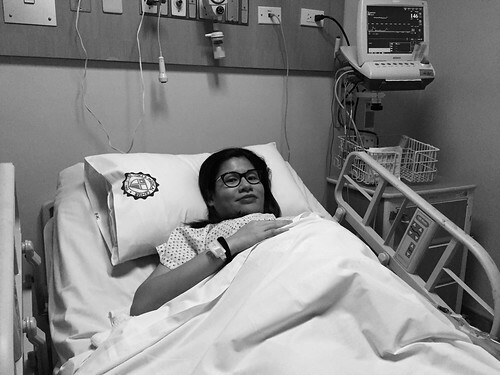 I had a suspected tumor on my left ovary and its nature needed an operation to find out if it was cancer. Surprise #2. Our prayer life deepened and I would have bouts of crying. Hearing that you have a suspected tumor brought some fears. Is it cancer? What if it is? Will I be needing chemotherapy? Will we still have a child? I was just desiring for a child and I was given a “tumor” instead.. I really felt ashamed and felt like a burden to my husband. I knew he wanted to be a dad, but instead I had this.. I wanted to respond better but I felt bitter.. But God had a plan and I am so thankful for this experience looking back now in 2018. It was also my first time to see my husband deep in prayer, crying with me and contemplating on what next steps we should take. Even with this setback, God has provided us with people to help us on this journey. I am not sure if I should name them but there were 2 women in our life who shared with us their journey on their ovarian cyst. We are very grateful for them. We met with other doctors for 2nd, 3rd, 4th opinion and they recommended open surgery because they had to be careful with the mass and do a biopsy. They were going to do an open surgery so they can check within 45 minutes if it was cancer or not. If it was, they may have to remove all neighboring organs since it may be affected, worst case scenario. We really didn’t want an invasive surgery and looked at laparoscopic treatment. But was rejected by the doctor because of its nature. We prayed for God to come through and take it away miraculously on our next ultrasound. But it was still there! We sought prayers from our family, D12 leaders, and close friends. We prayed, prayed and cried and we asked God for wisdom what to do. Then we had to do a tumor marker test. It came out negative. Praise God! Then we had to do another ultrasound.. The words “suspicious of non-benign in nature” what does this mean? It’s so confusing. I was cleared from the tumor marker but the ultrasound indicates a non-benign growth. Also I was higher than normal in other cut-off’s. We prayed and prayed for wisdom. When we consulted a gyne-onco (Gynecologist and cancer specialist) for the second time, he quoted us a ridiculously huge amount to do the procedure. It was shocking but then he also said that it was urgent but he can wait until our best feng shui date. What does that mean? We don’t believe in feng shui. And what if we did and the best feng shui date is 2 years from now? (i don’t know how this works!) Then it means it’s not urgent.. and it may not be cancer. We thank God for this sign that helped us decide what our next steps would be. It was such a relief. God came through but it’s not how we expected it to be. He just wanted us to trust Him. We started to ease up and relax. We immediately decided to change doctors and went for my mother-in-law’s trusted OB, Dra. Decena in UST. We thank God for her. After a consultation, we decided to schedule an operation. We wanted to enjoy the remaining days of my normal self because we didn’t know what awaited us after. We let it off our minds and celebrated our 1st anniversary in Phuket, Thailand which we enjoyed so much. A week after, off to UST we went. How could I share the experience? It was a mix of worry and excitement. I had my devotion at the hospital and this was what God impressed in my heart. Then preps for the operation began a night before. The blood tests, x-rays were fine but after!! Que horror really. Enema was performed all over and over again on me! I wished I hadn’t eaten that piece of cake and my last meal of Greenwich lasagna. Took me around 13 trips to the toilet. I was so exhausted and my nurse was laughing and saying I ate too much so I’m suffering this much 😛 We started at 8pm we ended at 11pm. IMAGINE. I felt so many pounds lighter after. I then took my last bath and off to bed I went praying that everything will be ok. And the peace of Christ was there. I slept like a baby. The next day, I was woken up at around 5AM. I was transferred to the operating bed. Goodbye mommy, Goodbye hubby, see you on the other side. They wheeled me into an enclosed room which was the operating room. The interns were with me and chatting with me, I really felt comfortable. And then they told me they had to prep the uterus area. OKAY do what you have to. 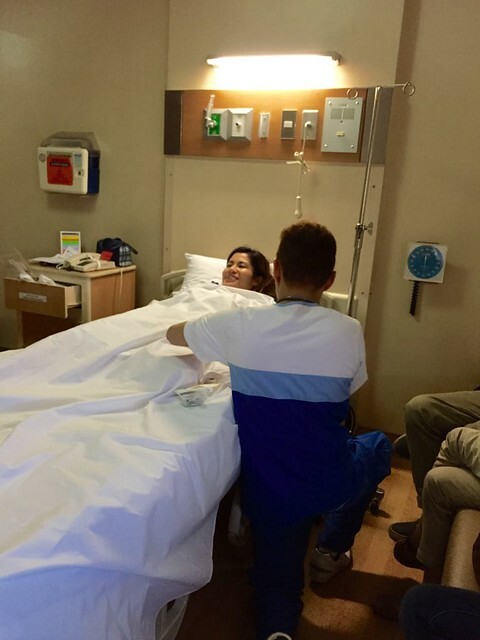 Wala nang privacy, it’s fine, ganun talaga..
Then my anesthesiologist came, I remembered chatting with her and when she gave me the dose, I just heard her last words counting down 3, 2, 1…. and I was off to La la land. The next thing I knew my mom was talking to me! in the RECOVERY ROOM! Visitors not allowed mommy. 😛 She was mistaken as a doctor so they let her in. <Grabe sya o.> And my mom was asking me to just grunt I’m okay to my Tita/Ninang nurse in the states over her cellphone. 4 hours had passed from the operation. I remembered being too weak and I was shivering in the recovery room I had to talk and ask for a blanket. An image flashed on my mind, was I still opened up that’s why I felt cold?? They gave me this heated blanket and I fell asleep again. 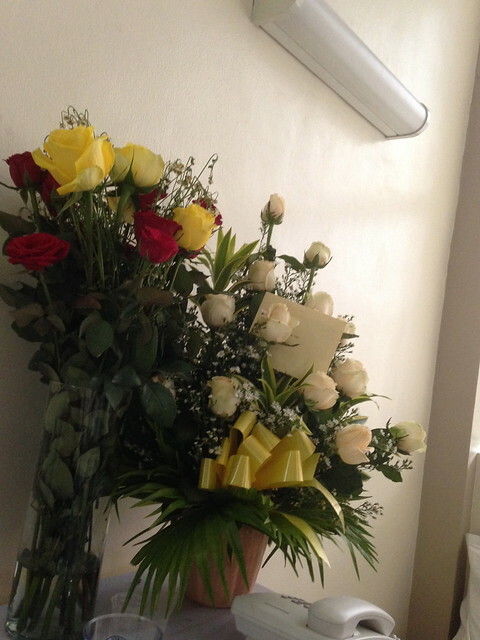 Next thing I knew I was back in my room with a bunch of flowers waiting for me. Thank you hubby and to my family.. The tumor / cyst was benign, praise God! 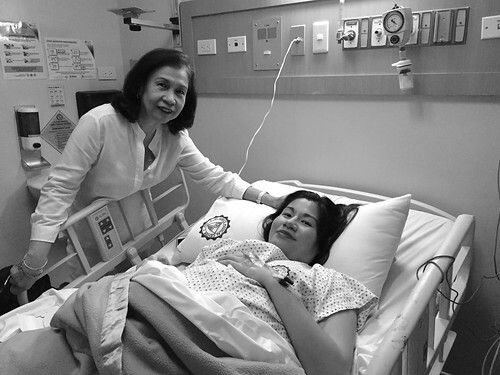 We thank God, our family and friends who prayed with us..
Side story, while I was still opened up, my mom told me that Dra. Decena came out of the operating room shouting “Arnie! it’s not cancer!” after finding out the results. I looked down on my uterus area and I just saw this big bandage and I couldn’t feel anything. It was difficult to cough, to move. I stayed in the hospital for around 2 more days and I remember when I had to get up it was so hard! I felt like my guts were going to spill out. It felt so tender but I had to go pee and do #2 to know if my organs went back to its proper place. 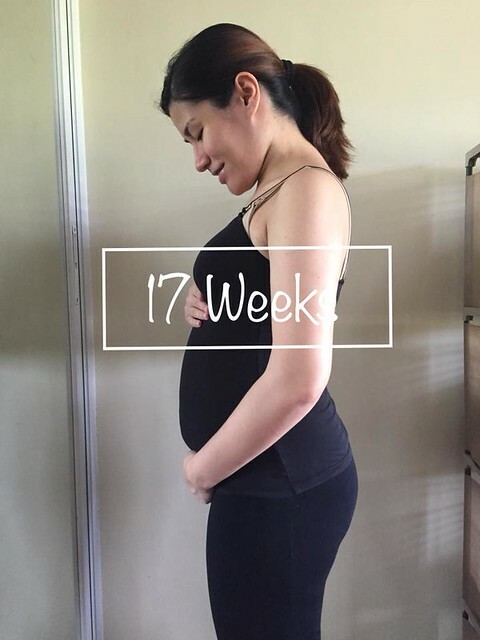 That whole year I looked pregnant and I was mistaken a lot of times by people who didn’t know what happened, because my tummy jutted out. I couldn’t exercise it felt so numb and come to think of it, it still feels numb. I have a scar on my tummy, my husband doesn’t mind and it just reminds us how God continues to be faithful in our lives. We are grateful to be out of that episode and yet we sympathize with those who still are. We know how it feels to go through all those. 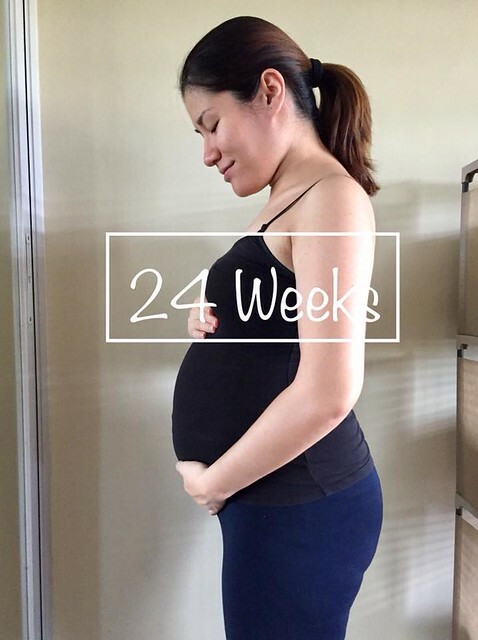 Months after… we asked, is it baby making time yet? Am I cleared this time? Life is…complicated but really, it is simple!